The Kursk submarine disaster took place back in 2000 when I was a mere adolescent, my mind too occupied with thoughts of anxiety and other teenage woes. It was only when I was much older that I understood the gravity of this terrible accident. Kursk, a Russian sub, sank during a training exercise on August 12 and rescue attempts were shoddily executed. Misinformation about the state of the mission was rife and deliberate, and many of the victims’ families only found out about the sinking via the news. Making this more treacherous was how the Russian government was maddeningly steadfast in refusing offers of assistance from other countries, with the newly appointed President, Vladimir Putin, only authorizing the navy’s acceptance of help on the fifth day of the rescue. But it was too late then; there were no survivors. 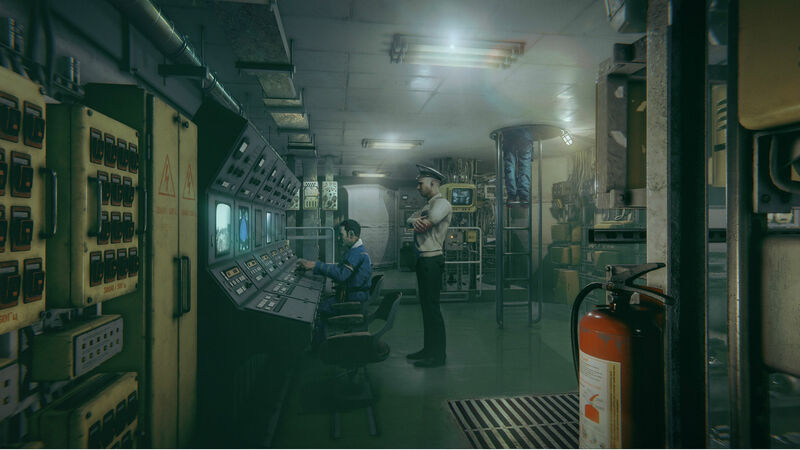 So from the outset, Kursk wasn’t a game that could weave more clarity into the mishap or inject even a glimpse of optimism into its experience. Thus lies its biggest challenge: to relate a story whose devastating conclusion is already common knowledge, while still keeping the premise fresh and relatable. In its attempts to do just that, Kursk enlists the player as a spy who infiltrates the submarine. Your task, therefore, was to learn more about the submarine and gather whatever intelligence you can uncover. It was a role I was eager to embrace; I thought this could offer a snapshot of what it was like to work in a submarine, allowing me to participate in the haunting final moments of being among the last surviving crew members. It was disappointing, therefore, to eventually find out that Kursk was disappointingly humdrum, even offensively boring. Life in one of the most ill-fated submarines in the world proved to be largely underwhelming, as you traverse through the countless corridors in search for nefarious secrets to plunder. There was nothing. And instead of fostering a sense of comradery with the crew, I found them strangely alien and lifeless, more akin to mannequins waiting around for something to happen. Most of the time, they pushed buttons, stared into space, made inane comments and assigned pointless challenges for me to fulfill. In one instance, I was supposed to send a top secret email to my superior about the state of the ship, but gaining access to the only laptop in this metal vessel means having to — I kid you not — put together a birthday present and beat the resident gamer’s high score in a ridiculously onerous arcade game. “I’ll get you what you need if you can beat my high score,” said the wastrel. I glared at him in disbelief. Meanwhile, the bulk of my time is spent walking to and fro through various rooms, unlocking doors, taking photographs and playing retro handheld games. Against my better judgement, I saw the game all the way to its credits. One night, I fell asleep at my desk while trying to complete an assignment and was suddenly jolted awake an hour later by my awkward posture. For the rest of the night I couldn’t go to sleep, my brain racing furiously with thoughts of mortality and loneliness, every heavy thud of my palpitating heart a reminder of my imagined, impending doom. After struggling for an hour, I decided to give up trying to sleep. I don’t know why, but I played Kursk. It was then I discovered that strolling through the ship’s endless, winding corridors and the monotonous act of opening and unlocking a multitude of doors, were the balm my heart needed to calm down. The next few days were spent finishing up the game’s remaining chapters. It wasn’t very exciting, but the predictability of the grind allowed my wandering mind to settle down. I guess this isn’t high praise for a game that’s supposed to be a provocative examination into the Kursk incident. In the game’s final chapter, the submarine’s captain told me, his blank eyes devoid of emotions, that he’s planning to write a letter to his fiancé in case the rescue team finds them. Then his hand started moving in a circular motion and no words came out. Everything is a poorly patched-together charade in Kursk. Even as the spy breathed his last moments in a maelstrom of fire, I found myself oddly at ease with all that was happening. An epilogue of sorts scrolled by, then the credits. I turned off the computer and scampered off to watch a Chinese reality dating show with my dad.